Two things begin to happen in Book 11. First, the nature of the game changes. Up to this point, we have been adventuring in the lower level zones of Azeroth. Lower level zones were easily navigable on relatively safe roads. Multiple towns and quest hubs in each zone were easy to reach and well supplied. Quests were mostly limited to the zone where you found them, or messengers to take you from one zone to the next. Now we'll find remote, out of the way villages with little more than a flightpath and a vendor. Roads, where they exist, are overrun with mobs and no longer offer safe passage. The general difficulty of the world has been kicked up a notch and if we're not prepared for that, we may find ourselves surprised and frustrated. The second change is that the quests have become more interesting. Many of them are still vehicles for delivering experience points: go there and kill 15 of those. But now, the tasks become more complex and the stories they tell are a bit more rewarding to take part in. Quests like Cortello's Riddle may now require extensive travel through multiple zones located at opposite corners of the world. Successfully completing these long quests chains requires us to pay a little closer attention. As we begin this chapter, we should be around level 47 and have just finished with Stranglethorn Vale. We have several long distance errands coming up, and we need to take care of them now. At the end of the last book, we traveled to Ratchet. From Ratchet, fly to Mudsprocket in Dustwallow Marsh, where we'll track down the next clue in Cortellos Riddle. It's found "in a Cave in the southwest" which refers to the Bloodfen Burrow (32, 66), where we fought the boss raptor Goreclaw. You should be able to avoid aggroing most of the raptors, and slip unnoticed past Goreclaw in front of the cave. Clear the three inside the cave, however, and find the next scroll at the very back. This offers the quest Cortello's Riddle (43): "Hinterlands". Return to Mudsprocket. If you're interested, at this level we could complete the quest Challenge Mok'Morokk (45) in Brackenwall Village. Next, we need to travel to Ferelas. To reach Ferelas if this is your first visit, fly into Freewind Post in Thousand Needles. Take the main road all the way to the west. You will pass the Night Elf post of Thalanaar on the right, but be careful to stick to the road and it will lead up into the green forests of Ferelas. This road leads directly to Camp Mojache. Although there are many quests available, start by crossing the bridge and picking up the flightpath on the left. Turn to face the longhouse and at the far left end, outside, find Witch Doctor Uzer'I. He offers A Strange Request (45), which is indeed odd, because it is a messenger quest to Orgrimmar, and we've only just arrived. Climb the hill up to the inn and set your hearthstone there. Now, fly to Orgrimmar. In Orgrimmar, Neeru Fireblade is found just beside the entrance to the Rage Fire Chasm instance, inside the Cleft of Shadow. Neeru will give you the next in the series, Return to Witch Doctor Uzer'I (45). Using your hearthstone, if it's available, return to Camp Mojache in Feralas. Turn in Return to Witch Doctor Uzer'I and the Witch Doctor, gives you another long distance quest, this time to the Hinterlands: accept Natural Materials (50), and Testing the Vessel (47). Our next destination is The Hinterlands. Fly to Orgrimmar, take the zeppelin to Undercity, and fly down to Tarren Mill. Travel to the back of Durnholde Keep and you'll find a path that leads north from there, beginning at 84, 31. Follow this path until you reach the Hinterlands. At 11, 51, look to your right and you'll see a ruined dwarven house. Leave the path at that point and strike out across the fields, looking for the Troll village Zun'watha at 23, 58. Clear this village, killing 20 trolls and gathering their heads. When you have 20, right click the Spike in you pack, to load the heads on to it. Standing next to the fire, click the pike again to plant it and complete the quest. On the table behind the fireplace. Find several Venom bottles, and click one to start a quest of the same name Venom Bottles (43). Next, travel to the temple of Shadra Alor in the southern central part of the zone at 35, 63. As you travel across Hinterlands, you will find the Primitive and Savage Owlbeasts you need to complete Testing the Vessel. The Primitive owlbeasts are lower in level, and so easier to kill. The witch doctor gave you something that looks like a drum. Drag that icon to your task bar. After you kill an owlbeast, be sure to loot the corpse because they will drop the quest items for Natural Materials and they will drop Giant Eggs which are in demand for another quest. You must loot first because the corpse will disappear when you do the next step. Target the body and click on the drum on your task bar. After a brief explosion, you will have gathered a Wildkin muisek. You only need 10 of these to complete the quest, although you can continue gathering them beyond that point. You don't need to collect all your Natural Materials before we leave, because we'll have other opportunities to do so. Cross the Hinterlands, heading for Shadra Alor. Once you reach the entrance to the troll temple, ride past the spider/troll mobs at the entrance and jump onto the pond in the center. You may have to fight one troll at that point. Then look for the sacrificial altar at the south east shore of the lake (35, 72). You should be able to climb up to it safely. From this location, you will be able to see the question mark for the Atal'ai Exile on your mini-map. Now look for a path up into the hills to the south east. You will want to curl around to the right as you climb and you will find yourself directly above the Atalai Exile. Speak to him to complete your quest. He offers the next, Return to Fel'zerul (44). Leave the temple area through the front gate, and regain the road. Travel to the north east, following the road. You want to reach the river that flows along the northern border of the zone. The easiest way across the higher areas of Hinterlands is to find the river and simply follow it all the way to the coast. You want to reach the very high waterfall at 79, 46 on the Overlook cliffs. Standing at the top of the waterfall, you will see the question mark for Cortello's Riddle on the mini-map. Carefully make your way out onto one of the protruding rocks and jump off into the pool below. This beautiful spot for cliff diving is the other part of the reason we came this way. Under the water of this pool, at 80, 46, dive down to find the box holding Cortello's Treasure. The payoff for this adventure is a 14-slot bag and 8800 xp. Swim to the shore on the south side to find a field of turtles stretching to the south. Just beware of the single red-named turtle, Gammerita. Along the shore, here, you will find glittering blue bottles that are needed for the quest Whiskey Slim's Lost Grog. Just right click to gather them. By the time you've reached Revantusk Village, the Horde settlement in this zone, you should have collected all the bottles you need. In Revantusk, run to the end of the dock to find the flightpath. Then, fly to Terran Mill and give your bottles to the Apothecary. He offers the quest Undamaged Venom Sac (45). Accept the quest but we aren't heading back to Hinterlands right away. Instead, we'll be returning to Ferelas. Use your hearthstone, if it's available, or fly to Undercity and take the Zeppelin to Orgrimmar. Travel to Feralas. On the south end of the longhouse, turn your quest in to Witch Doctor Uzer'i. He accepts Testing the Vessel and offers Hippogryph Muisek (47). Pick that up, and we'll get to it later. He also offers a simple messenger quest to Tanaris, Sunken Temple. Accept that as well, and we'll turn it in on our next visit to Gadgetzan. Now leave the Witch Doctor and find Orwen Gizzmik, a goblin over by the water, beyond the flightmaster. Accept from him Gordunni Cobalt (43). Walking along the path in the center of the village, locate Rok Orhan, in the red armor, and accept The Ogres of Feralas (43). Cross back over the small bridge and leave the village to the north, heading for 74, 35 on the north west side of Lariss Pavilion. This is the base of a path leading up to the Gordunni Ogres. Climb the path and as you are clearing the ogres, look for glowing blue spots on the ground. The blue spots signal the possible presence of cobalt. Stand next to the blue spots, and right click on the shovel in your pack. A sparkling pile of dirt will appear next to you. Loot the dirt and look for the Cobalt. It drops every 3 or 4th spot. The rest is junk. 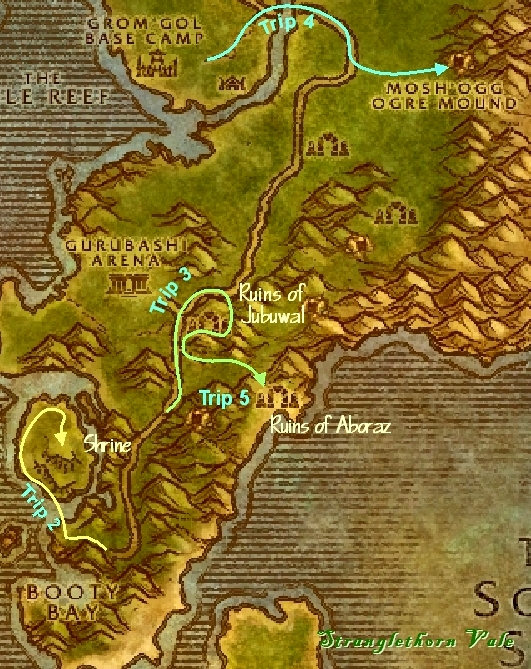 To complete the Ogres quest, you want to head back to the upper area at 75, 29. Most of the Ogre mages and many cobalt areas are back here. While in this area, look for a scroll on the ground. Right click on this scroll to start the quest The Gordunni Scroll (43). It could be by the campfire, beside the cooking pot, or up by the cave entrance. When you have all your ogres, all 12 cobalt, and when you have found the scroll, you're ready to leave the area and return to Camp Mojache to turn in three quests. Two of these go to Rok Orhan, while the cobolt goes back to the goblin near the flightmaster. There is another series of low level quests offered by Hadoken Swiftstrider hiding on the right side of the longhouse. If you need more xp, this quest series is available, but entirely optional. Ignore any other quests, for now, and fly to Gadgetzan. Our next quests will be in Tanaris. Newly arrived in Gadgetzan, look for the Inn on the east side of town. 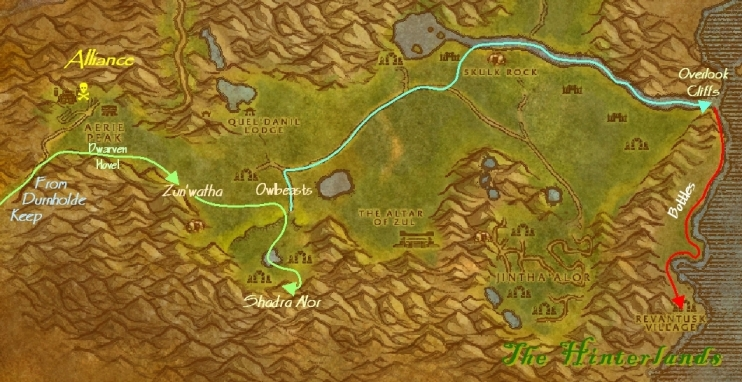 Just south of the inn, underneath the watertower, find two quests, Water Pouch Bounty (44) and Wastewander Justice (43). On the north side of the Arena, find a wanted poster for Wanted: Caliph Scorpidsting (46) and Wanted: Andre Firebeard (45). Now leave Gadgetzan, riding east. When the road passes between the first groups of rocks, you will begin to see water towers to the south in the desert. Leave the road and continue straight east heading for the northern group of towers. Here you will begin to see the mobs for Wastewander Justice. The Thieves are the more rare of the two mobs, so give them priority. If you happen to see Caliph Scorpidsting, be aware that he is usually accompanied by two stealthed rogues, so clear the area and be prepared to fight three. You don't need to find him on this visit, however. When you have your mobs and 5 water pouches, return to Gadgetzan to turn in these quests. 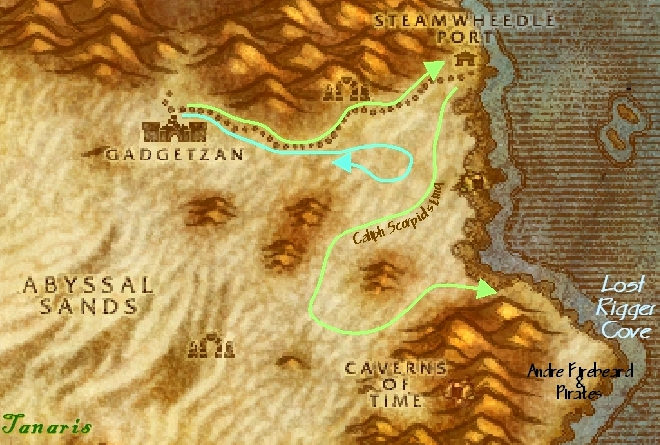 From Gadgetzan, follow the road east all the way to the coast, where you will find Steamwheedle port. This is an important nexus for quests to the Southsea Pirates. From the hut to the south of the dock, collect Southsea Shakedown (45), and Stoley's Shipment (45). In front of the vendor huts, accept Pirate Hats Ahoy (45) and Wanted: Andre Firebeard if you don't already have it. Also in this area is the troll Yeh'kinya who offers you, Screecher Spirits (44), a quest to take back to Feralas. Now return to the south west into the Waterspring Fields to engage in a second round of More Wastewander Justice. Most of these mobs are at the southern end of the Wastewander area. For me, the rarer mob was the assassins, and the rogues are stealthed. I found Caliph Scorpidsting in the center of the area, as I was clearing around a water tower. He has a very long patrol path from the south west to the north east corner of the area, so keep your eyes open for him as you fight. You need to kill him on this visit. Work your way to the south east corner of the Wastewander area, then look for a tunnel in the cliffs along the beach at 68, 41. This is the entrance to the pirate's area, where our pirate quests from Steamwheedle are completed. Pass through the tunnel and observe the camps on the other side. The area you are ultimately heading for is beyond the wooden stockade to the south. All of the pirates in this area are needed for one quest, and they drop the Southsea pirate hats needed for another. Clear your way through the camps to the fence. Inside the stockade, Andre Firebeard hangs out with a group of pirates in the center of the yard. At least two, possibly three adds will come when you pull him. If these prove too much, concentrate on Andre and bring him down, then run back through the gate and out into the water until you lose aggro. Return to loot his head. Back inside the gate, look to the right to find a two-story building. The boxes of Stoley's shipment are found on the second floor. Expect at least two pulls of two or three mobs inside. Straight across from the gate is a large ship out of the water and under construction. Working on this ship are the Dock Workers. The Swashbucklers are out on the pier next to the floating pirate ships . Freebooters (shooters) and pirates are scattered throughout the remaining areas. All of these mobs drop the Pirate hats. They may also drop a Pirate footlocker. Opening this green footlocker in your inventory may produce a Ship schedule or a Map fragment, or a Captain's key. The Ship schedule begins a quest of nearly the same name Ship Schedules (45) that can be turned in back at Steamwheedle Port. The rest are for a different quest that we will not pursue. Complete your pirate kill list, collect Stoley's shipment and Andre's head and all your Southsea Pirate Hats. At this point, with or without the Ship schedule, return to Steamwheedle Port and turn these quests in. Ride back to Gadgetzan and turn in the final two quests, More Wastewander Justice and Wanted: Caliph Scorpidsting . This is the end of our first major quests in Tanaris. Fly North to Ratchet, and take to boat to Booty Bay. When we arrive in Booty Bay, we should have Delivery to MacKinley. Turn in MacKinley's quest and accept one from him in return, Voodoo Dues (44). Run over to the inn and on the ground floor complete Whiskey Slim's Lost Grog. In the same room, accept Zanzil's Secret (44) from Crank Fizzlebub. Now take a minute and fly up to Stonard and turn in Return to Fel'zerul. The next quest is for the Sunken Temple instance, so we won't pick it up now, but you will be ready should an opportunity to enter that important instance arise. Fly back to Booty Bay. We should have Mok'thardin's Enchantment. Pick up Akiris by the Bundle (43) from Privateer Bloads down by the bank. These two quests are completed in the same area. Leave Booty Bay and turn left down into the cove we investigated a long time ago. Bypass the camp and cross the bridge on the right. After a small area with more Bloodsailors, you'll find the naga who drop the Akiris Reeds. Hunt these Naga Explorers north along the waters edge, following it as it curves inland along a river. Look for a road that climbs the hill on your right, and then pass through the arch at the top. Cross the bridge to find the spring and get your Holy Spring Water for Mokthardin. Stay in this area to complete the Akiris gathering. In the first 10 naga kills, I only gathered 3 akiris reeds, so this may require a little patience. Now return to Booty Bay and give the Akiris Reeds to Privateer Bloads. Leave Booty Bay and travel north until you reach the outside of the Gurubashi Arena. Across the road from the Arena you will find the Ruins of Jubuwal. Here is where we need to get to work. The mobs within the ruins drop Zanzil's mixture and you will find Jon-Jon, one of the mobs for Voodoo Dues, standing by the fire. The next named guy, Maury "Club Foot" Wilkins is in the walled area to the north of the fire. After clearing the ruins, I had collected 7 of the 12 Mixtures that I needed. Leave the ruins and look south down the road toward Booty Bay. Just before the gated archway, turn left to find a pathway that leads out to the sea. Follow it until you come to the back of another ruins: the Ruins of Aboraz. If you look to the right up by the ruins, you will find Yenniku; someone we must return to at a later step in this quest series. Stay to the left, however, and clear out these mobs to collect a few more Mixtures. On the ocean side of the ruins in an alcove, you'll find Chucky "Ten Thumbs." Loot Chucky's huge ring and then remain in the area, killing mobs until you have all the bottles of Zanzil's mixture. Return to Booty Bay. Talk to Sea Wolf MacKinley to complete Voodoo Dues. Wait for a few moments and he'll complain that he can't open the Club foot. Talk to him again to get the next quest, Cracking Maury's Foot (44). On the ground floor of the inn, Fizzlebub takes your Mixtures. After a few moments, he offers you the next quest, but DON'T TAKE IT YET. This is Zanzil's Mixture and a Fool's Stout (44), and it's a timed messenger quest to Shimmering Flats. You have 2 hours, but we still have things to do in Stranglethorn, so we'll pick it up later. Now run out to the main road and turn south. We're heading for the Mosh Ogg ogre mound visible on your map. The path to the cave starts at 47, 25. Your objective is to enter the cave and fight your way back to the boss. Don't be put off your guard by the low level ogres outside the cave. The level 44-45 Ogres inside are slightly more difficult. Nothing we can't handle easily, of course. At the very back of the cave, you'll find Mai'zoth (45), the ogre boss guarded by an Ogre Lord and Spellcaster. You should be able to pull the two guards first, without aggroing Mai'zoth. The boss drops the Mind's Eye for Kin'weelay. Now stay in the cave until you find Maury's Key if it hasn't dropped already. You should certainly get it in one clearing of the cave. Now return to Grom'gol. Give The Mind's Eye to Kin'weelay and he will work his magic on it. Then he offers you the next quest, Saving Yenniku (46). With the quest, Kin'weelay also gives you a Soul gem, which you should place on your hotbar. Now return to the Ruins of Aboraz, where we found Yenniku earlier at 39, 58. Clear out the few loose mobs, but don't attack Yenniku. Target him and walk up to him. He will aggro and attack, but ignore this. Click on the Soul gem on your taskbar, and he will be stunned, offering you a blue question mark. Speak to Yenniku, complete the dialogue and you will receive the Filled Soul Gem. Return with this to Nimboya in Grom'gol to complete Saving Yenniku. Now fly down to Booty Bay and give MacKinley Maury's key. Pick up Zanzil's Secret and the Fool's Stout from Crazz, and remember that the clock is ticking on this timed quest. Take the boat to Ratchet, fly into Gadgetzan and travel north to Shimmering Flats to deliver it. This concludes our final quest in Stranglethorn Vale. You should be well into level 49, and Mackenzie had reached level 50. Fly into Gadgetzan, and then ride north to Shimmering Flats. Give your Fool's Stout to Kravel Koalbeard to complete the first timed quest. Again wait a moment and talk to Kravel again to accept your next quest, Get the Gnomes Drunk (42). (You can also have a go at the Goblins with the same result.) This starts another timed quest, but the gnome you want is right beside you. Speak to him to distribute the spiked stout. Then return to Kravel to complete the quest. Kravel offers you another, Report back to Fizzlebub (42) but with only a moderate 2600xp reward, we are not going to make this a priority since we're heading the other way. 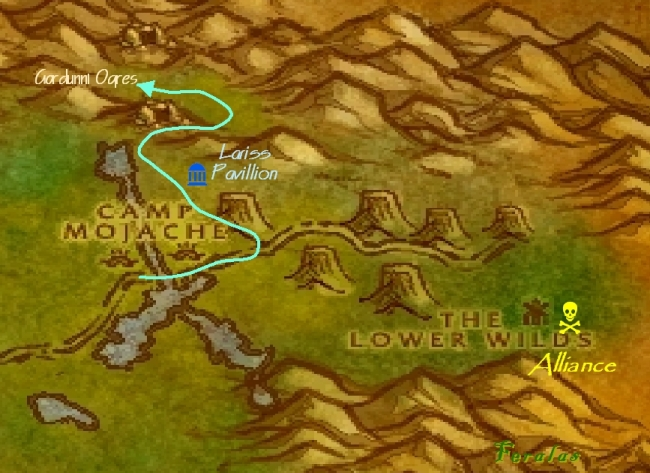 Run back to Gadgetzan and fly to Camp Mojache in Feralas. This page last modified 2008-10-07 22:00:44.